Black-glazed ceramics had humble origins and most were generally inexpensive utilitarian wares used by the middle class. 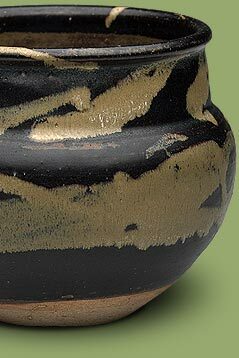 From the tenth through thirteenth centuries, however, a high demand for vessels with thick, brownish-black glazes spread throughout most levels of Chinese society. It is estimated that, during Sung (960-1279), more than a third of all kilns produced some form of brownish-black glazed ware and frequently imitated the black wares of each other in highly competitive markets. Important centers of black ware production operated in both north and south China during Sung. The Chien kilns in Fukien province were famous for lustrous black wares decorated with a variety of iron rich compounds to create their fabled "hare's-fur," "partridge-feather," and "oil-spot" glazes. The Chi-chou kilns in Kiangsi produced an even greater variety of glaze techniques cleverly incorporating stencil wax resist, leaf, and splashed designs into their stoneware tea bowls. Several centers in north China, many of them Tz'u-chou kilns in Honan and Shansi, produced rich black wares enhanced with iron russet splashes "oil-spot" effects and "cut-glaze" designs.